Even though it’s still swelteringly hot in some parts of the country, it never really warmed up in San Francisco, making it easy to transition into fall thinking. And it’s funny to say, but I never fully understood the value of a sweater before I moved here. Perfect as an outer or mid-layer, sweaters are my newest obsession. In fact, you’ll often find me stealing my boyfriend’s sweaters, as he has a colorful collection that’s wonderfully oversized on a girl like me. This year, I’m all about pullover sweaters. While cardigans are great, I love a pullover sweater for its layering prowess. It looks great under a jacket or coat, and a crewneck pullover goes fabulously well with a bib, collar or embellished necklace. I am especially obsessed with two kinds this fall, the first of which being these chunky sweaters. To keep your sweater look contemporary, don’t go for one that’s entirely form-fitting — look for drapey or boxy cuts or go a size or two up to achieve a perfectly casual look. I also love these sharp, citrus-inspired colors, perfect for brightening a winter’s day! My second sweater obsession this fall is printed sweaters. 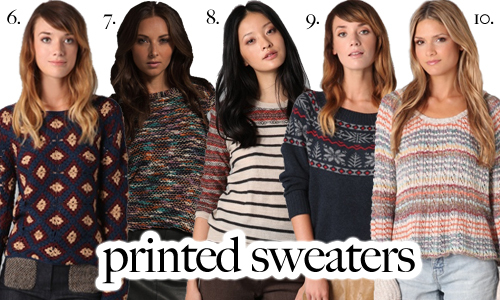 With a vintage feel, these sweaters have the perfect combination of rustic texture and modern pattern. I love the effect of a print, particularly in the fall and winter when things tend to be solid and drab. This probably has a lot to do with my current obsession with all things Missoni and Proenza Schouler, because I can’t get enough of stripes, prints and patterns right now!